"Add a little "TrueJoy" to your life!" TrueJoy Miniatures is a small family owned and operated farm located in southern New Jersey, We are in Washington Township, Gloucester County, approximately one half hour from the Walt Whitman Bridge and Philadelphia. 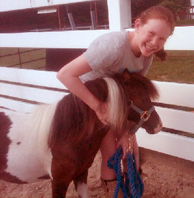 Our herd is a group of quality AMHA and AMHR registered miniature horses, that have been selected for size, conformation, bloodlines, color and personality. Each horse receives daily individual care and love. Our horses receive regularly scheduled veterinary care, worming, and immunizations as well as regular farrier visits (hoof trimming). We produce only a few foals each year. This allows us the time to raise friendly, curious, people oriented babies. We imprint every baby at birth, and spend a great deal of "hands-on" time with each foal every day. 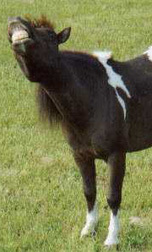 Every horse has been DNA tested, and each foal can be parentage qualified. Our bloodlines include such royalty as Hemlock Brooks Silver Legend, Rowdy, Bond Sir Galahad and Lazy Ns Boogerman. 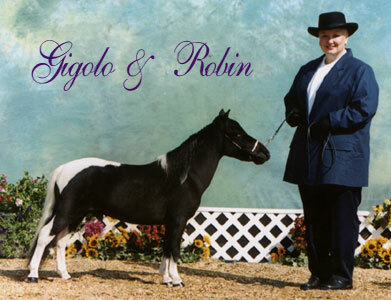 Our goal is to breed quality miniature horses that are a credit to the breed. We strive for the smaller type miniature while maintaining correct conformation according to AMHA standards. While believing that conformation is paramount, we love LOTS OF COLOR too. Our foals are all colorful PINTOS as our main herd sire is homozygous for tobiano(pinto), which means all his foals will be pinto! Many of our foals will have "GGA" in their name to honor the world's best Dad, George G. Andress Jr. I wish to thank my Dad, and my wonderful husband, Carmen, for being so supportive and for helping me in achieving my dream. 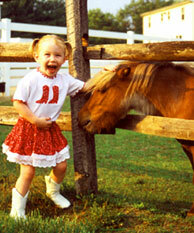 Please feel free to contact us if you have any questions about our miniature horses. We love to talk about them! Call us for an appointment to see our sales horses. Minis still make me happy!